Swoop heroic knight Aaron into action on his hover shield! Shoot his Blazer Bow stud shooter at the Lock & Roller’s Forbidden Power shield to release the cage door and rescue Queen Halbert, but watch out for the GargoBike’s claws! 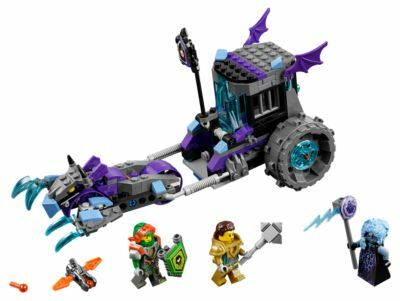 Includes two scannable shields for the NEXO Power Gorilla Roar and Forbidden Power Wrecking Wrath. Last known price is 135% above the initial Lego retail price! The Ruina's Lock & Roller (70349) Lego set is no longer directly available from the sites below. However, 3rd party partners of these sites might still have the set available. Alternate description Rescue the queen from Ruina’s Lock & Roller! Includes three minifigures: Aaron, Queen Halbert and Ruina. Ruina’s Lock & Roller features a detachable GargoBike vehicle with minifigure cockpit and translucent-blue claws, and a rear vehicle with opening cage, collapsible Forbidden Power function, shield holder and wing elements. Attach the shield to Aaron's feet and use as a hoverboard to role-play a flying rescue scene! Push the Forbidden Power shield holder to open the cage doors. Weapons include Aaron's Blazer Bow stud shooter, Queen Halbert’s club and Ruina’s Lightning Scythe. Also includes Aaron’s shield holder. Scan shields for the NEXO Powers Gorilla Roar and Forbidden Power Wrecking Wrath, then power up in the LEGO® NEXO KNIGHTS™ game! Measures over 4” (12cm) high, 9” (23cm) long and 3” (9cm) wide.